It seems to me one more proof of the overweening gnostic tendency in philosophical thinking to ascribe to God qualities which are the product of our own anthropomorphic formulations. ~Carl Jung, Letters Vol. II, Pages 254-256. Carl Jung and his associate G.R.S. Mead worked on trying to understand and explain the gnostic faith from a psychological standpoint. Jung's analytical psychology in many ways schematically mirrors ancient gnostic mythology, particularly those of Valentinus and the 'classic' gnostic doctrine described in most detail in the Apocryphon of John (see gnostic schools). However, it is uncertain as to whether the similarities between Jung's psychological teachings and those of the Gnostics are due to their sharing a "perennial philosophy", or whether Jung was unwittingly influenced by the Gnostics in the formation of his theories. Jung's own 'gnostic hymn', the Septem Sermones ad Mortuos (The Seven Sermons to the Dead), would tend to imply the latter, but after circulating the manuscript, Jung declined to publish it during his lifetime. Since it is not clear whether Jung was ultimately displeased with the book or whether he merely suppressed it as too controversial, the issue remains contested. Uncertain too are Jung's belief that the gnostics were aware of and intended psychological meaning or significance within their myths. On the other hand, it is clear from a comparison of Jung's writings and that of ancient Gnostics, that Jung disagreed with them on the ultimate goal of the individual. Gnostics in ancient times clearly sought a return to a supreme, other-worldly Godhead. In a study of Jung, Robert Segal claimed that the eminent psychologist would have found the psychological interpretation of the goal of ancient Gnosticism (that is, re-unification with the Pleroma, or the unknown God) to be psychically 'dangerous', as being a total identification with the unconscious. From thefifthbody.homestead.com - February 11, 2014 12:39 AM The Gnostics recognized the condition of exile as more than an event in history. They saw it as having a profound cosmic and even transcosmic dimension. The human spirit, they held, is quite literally a stranger in a strange land. "Sometimes I feel like a motherless child," laments the American spiritual. The Gnostics would have agreed and might have been tempted to replace "sometimes" with "always". The exile may indeed find himself in a dark land, but his very awareness of the darkness can also reveal a light on the path to freedom. So also, the awareness of our alieness and recognition of our place of exile for what it is are the first great steps on the path of return. We begin to rise as soon as we realize that we have fallen. Mythology as a vital psychic phenomenon is as necessary as it is unavoidable. In this discussion, it seems to me, the gnostic danger of ousting the unknowable and incomprehensible and unutterable God by philosophems and mythologems must be clearly recognized, so that nothing is shoved in between human consciousness and the primordial numinous experience. ~Carl Jung, Letters Vol. II, Pages 254-256. Knowledge and intelligence are by no means identical, as you know; there are many people who know a great deal, who labour under loads of information, without being at all intelligent. ~Carl Jung, ETH, Page 154. The Gnosis is a disturber of the peace of the Church, but it is full of psychological truths, many yet undiscovered. ~Carl Jung, ETH Lecture 8March1935, Pages 199. If a sudden separation occurs in the pleroma there arises the possibility of creation and consciousness. In the completeness of the pleroma there is nothing to explain or distinguish because change and causality cease to exist there. When we have achieved our greatest capacity for consciousness the task is to continue our efforts to carry into reality what we have learned. ~Carl Jung, Jung-Ostrowski, Page 9. They [Gnostics] were concerned with the problem of archetypes, and made a peculiar philosophy of it. ~Carl Jung, Evans Conversations, Page 17. The Pleroma, or fullness, is a term from Gnosticism. It played a central role in the Valentinian system. Hans Jonas states that "Pleroma is the standard term for the fully explicated manifold of divine characteristics, whose standard number is thirty, forming a hierarchy and together constituting the divine realm" (The Gnostic Religion: The Message of the Alien God and the Beginnings of Christianity [London: Routledge, 1992], p. 180). Somehow, as the Gnostics surmised, we have "collected" ourselves from out of the cosmos. That is why the idea of "gathering the seeds of light" played such an important role in their systems and in Manichaeism. ~Carl Jung, Letters Vol. II, Page 268. Considering that the light of Christ is accompanied by the "dark night of the soul" that St. John of the Cross spoke about, and by what the Gnostics of lrenaeus called the umbra Christi, which is identical with the chthonic aspect mentioned above, the life of Christ is identical in us, from the psychological point of view, with the unconscious tendency toward individuation. ~Carl Jung, Letters Vol. II, Page 268. But I wonder how it comes that so many people think I am a gnostic while equally many others accuse me of being an agnostic. ~Carl Jung, Letters Vol. II, Pages 53-55. I postulate the psyche as something real. But this hypothesis can hardly be called "gnostic" any more than the atomic theory can. ~Carl Jung, Letters Vol. II, Pages 53-55. You overlook the facts and then think that the name is the fact, and thus you reach the nonsensical conclusion that I hypostatize ideas and am therefore a "Gnostic." ~Carl Jung, Letters Vol. II, Page 245. It is evident that Buber has a bad conscience, as he publishes only his letters and does not represent me fairly, since I am a mere Gnostic, though he hasn't the faintest idea of what the Gnostic was moved by. ~Carl Jung, Letters Vol. II, Pages 64-65. I would abandon the term "Gnostic" without compunction were it not a swearword in the mouths of theologians. They accuse me of the very same fault they commit themselves: presumptuous disregard of epistemological barriers. ~Carl Jung, Letters Vol. II, Page 147. Very many thanks for kindly sending me your review of Aion. It stands out from all the others because it is obvious that its author has really read the book, which is something I am grateful for. I therefore venture to ask you to let me know in what sense you use the term "Gnosis." You can hardly mean knowledge in general, but more specifically the Christian or even that of Gnosticism. The possible metaphysical significance of these assertions is completely outside the bounds of empirical psychology as a science. When I say "God" I mean an anthropomorphic (archetypal) God-image and no not imagine I have said anything about God. I have neither denied nor affirmed him, unlike the Christian or Gnostic yvwm> which thinks it has said or has to say something about a metaphysical God. The difficulty which gives rise to misunderstandings is that archetypes are "real." effects can be established whose cause is assumed to be the atom (which is merely a model). Nobody has ever seen an archetype, and nobody has ever seen an atom either. But the former is known to produce numinous effects and the latter explosions. When I say "atom" I am talking of the model made of it; when I say "archetype" I am talking of ideas corresponding to it, but never of the thing-in itself, which in both cases is a transcendental mystery. It would never occur to a physicist that he has bagged the bird with his atomic model (for instance Niels Bohr's planetary system). He is fully aware that he is handling a variable schema or model which merely points to unknowable facts. This is scientific gnosis, such as I also pursue. Only it is news to me that such knowledge is accounted "metaphysical." You see, for me the psyche is something real because it works as can be established empirically. One must therefore assume that the effective archetypal ideas, including our model of the archetype, rest on something actual even though unknowable, just as the model of the atom rests on certain unknowable qualities of matter. But science cannot possibly establish that, or to what extent, this unknowable substrate is in both cases God. This can be decided only by dogmatics or faith, as for instance in Islamic philosophy (Al-Ghazzali), which explained gravitation as the will of Allah. This is Gnosticism with its characteristic overstepping of epistemological barriers. The Church's proofs of God likewise come under this heading, all of which beg the question if looked at logically. By contrast I pursue a scientific psychology which could be called a comparative anatomy of the psyche. I postulate the psyche as something real. But this hypothesis can hardly be called "gnostic" any more than the atomic theory can. So my question is: Wherein consists my "gnosis" in your view, or what do you understand by "gnosis"? Excuse me for bothering you with such a long letter. But I wonder how it comes that so many people think I am a gnostic while equally many others accuse me of being an agnostic. I would like to know whether I am making a fundamental mistake somewhere that occasions such misunderstandings. I would be sincerely grateful to you if you could lighten my darkness. C.G. Jung ~Carl Jung, Letters Vol. II, Pages 53-55. Jung, (CW 6: 52, par. 78). Gnosis, in the hands of Roberts Avens, is a perennial philosophy of the heart. 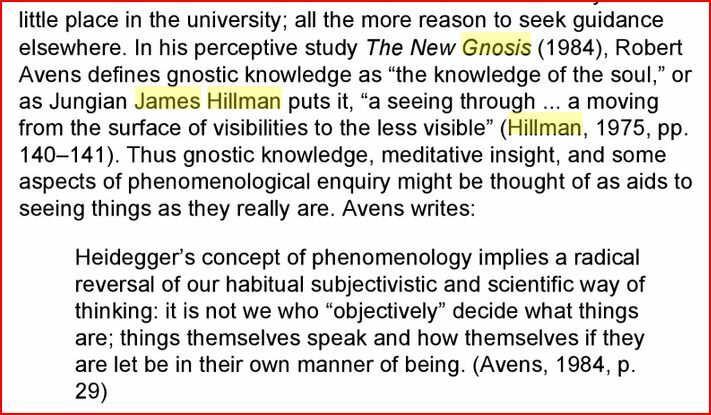 He provides a readable, uncomplicated, and reliable introduction to the Gnosis going on today in the poetical thought of Martin Heidegger and the archetypal psychology of James Hillman. As a psychological philosopher, Avens brings fresh meanings to basic gnostic ideas about angels, salvation through knowledge, and the world as alive and ensouled. Therapies that encourage personified images and ecology movements concerned with the soul in things can find here a profound philosophical ground in The New Gnosis. Literalism is itself one kind of mystery: an idol that forgets it is an image and believes itself a God, taking itself metaphysically, seriously, damned to fulfill its task of coagulating the many into singleness of meaning which we call facts, data, problems, realities. The function of this idol--call it ego or literalism--is to keep banality before our eyes, so that we remember to see through, so that mystery becomes possible. Unless things coagulate there is no need for insight. The metaphorical function of the psyche depends on the ever-present literalist within each of us. (150) With Hillman there are no literal ideas or solid facts. As a methodological reductionist he shrinks all literalisms to just another part of the psychic mystery and demotes facts to nothing but coagulated ideas perpetrated by the misinformed ego. All ego-generated facts are false Gods--idols which simply serve to remind us that everything is fluid and ever shifting. Psychology, according to Hillman must be practiced on the world at large and not just on people. Indeed it is the very view that only the person has psyche or soul which places an unbearable psychic burden on humanity, imprisoning us within our own psychologies and removing us from any genuine encounter with the world. The view that only humanity has soul, and that the rest of the world is dead and evil, is in Hillman's view, a cause of the contemporary crisis in our "environment". …nature exists without human aid, can deal with her processes herself, has everything in herself to bring about transformations, to move from the depths to the heights and down into the depths again. ~Jung, Modern Psychology, Page 42.
it happens to us unsought and unexpected. Gnosis is not Gnosticism. It doesn't require belief, scripture, or Apocrypha. The transformative perspective, observable in its real effects, unlocks the hermeneutics of the creative imagination. The life of the unconscious goes on within us without our conscious knowledge. Gnosis is an emergent property, not merely an introverted religious attitude. Embracing gnosis does not mean embracing Gnostic dogma or medieval doctrines -- participatory convictions based on personal desires and fears. The secret is inside the creation and based in the study of nature and our own nature. 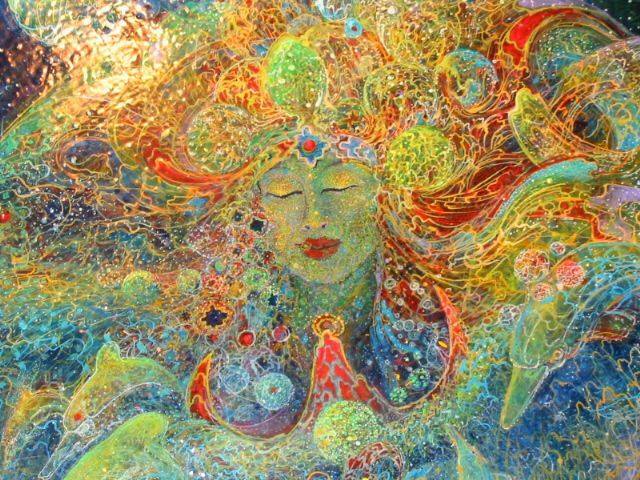 We become more integrated by bringing more of the unconscious and mythic into consciousness. Can we find the absolute in the depths of our soul -- the very source of symbols? Even physics declares our personal experience is profoundly subjective. There are two principle attitudes -- devotion and gnosis. Gnosis is not a philosophy, nor a way to rationally comprehend the world. All that is knowable is our immediate subjective experience. Our most personal "I" is our core subjective experience which is identical to awareness. That awareness is the ground where the objects of awareness -- sensations, thoughts, images, memories, and emotions -- fluctuate and intermingle. Fundamental awareness has no intrinsic form, content, or characteristics. So awareness is less about the dualism of mind and matter, light or dark, or polarized good and bad, but more about the dualism of awareness and the contents of awareness. Gnosis is not a ready-made religion but a more comprehensive view allowing psyche to speak for itself in dream, active imagination, synchronistic phenomena, premonitions, mythic living, and creative expression. "Self-redemption" is an arduous path that leads through self-deception. Insights in self-understanding come through grace, not labor or merit. Gnosis is a spontaneous personal event of primordial psychic experience. Empirical experience of the psyche may appear in modern dreams. Experiences of the collective unconscious may be reflected in gnostic literature, but are not derived from it. Those lacking such experience can never understand it, but that does not nullify its existence. Getting it conceptually is not the same as knowing it experientially, thus, all "esoteric" secrets remain concealed from the uninitiated. Continually recurring fundamental ideas can arise from the archetypal potentials of objective psyche. Generally similar ideas are modified by era and context. We can recognize their archetypal core. We live in archaic identity with the absolute unconscious. Archetypes are the psychophysical interface of emotion and energy, linking inner and outer realms. The form of opposites become distinct but conjoined as they enter consciousness. Such numinous assertions and feelings produced by psyche may or may not express universal 'truths'. We perceive the psyche with intuition, but not everyone has discriminating intuition and clarity. Our universal vision is as limited as our rational and irrational human vision. Intuition exalts and redeems us through connection with our core -- the midpoint of our internal Cosmos. True gnosis is an expansion of consciousness. But according to our concepts, beliefs, and assumed truths (psychological presuppositions), intuition can produce understanding or danger and destruction. Jung observed that belief is transformed into gnosis by individuation. Eternal knowledge or perennial wisdom is not intellectual. We imagine we are imagining "the real" but such consciousness can be used correctly or incorrectly. Because the psyche and archetypes are bi-polar they can produce either wisdom or utter nonsense. There is the path through the labyrinth that is a descent to the underworld, but there are also false paths, deceptions, and dangers on that path. Each must beware of spiritual pretensions and gnostic inflation, careful not to mistake ego for the interior Light, which helps us realize our own darkness. Rationality cannot eliminate the irrational but is part of the same phenomena. Beliefs arise from lack of experience and knowledge of psychic dynamics. More than one heart has been misled. The naive take the manifestations of the unconscious -- this natural psychic activity -- at face value, mistaking them for the essence of the world or revealed truth. Insights appear as natural revelations. Numinosities appear paradoxically true and untrue. Some manifestations are simply misguided inner authority or inferior notions, ideas, images, motivations, emotions, and the disturbances they create. A sense of certainty is no guarantee of accuracy. Experience is mythic, projective, and subjective. All of it adds up to nothing without psyche's infusion of value and meaning -- living psychological process. Conscious and unconscious comprehension are united by myth, which is preconscious and therapeutic. We must be modest, not mistaking 'our truth' for 'the truth'. Yet, it remains important to continue to pursue the search for truth in our lives. We are led inside ourselves by the assimilation of myth -- an inner journey. Sapientia Dei is revealed through the archetypes. The Gnostics considered themselves members of a new aeon marked essentially by the rise of spiritual man. Trusting their own spiritual powers, they plumbed their spiritual depths. Deeper layers of the unconscious are independent of culture and time. Myths remain myths even if some people take them as literal revelations or eternal truths. Myths are renewed in retelling with new spiritual language. In psychological insight, knowledge and understanding correspond with symbolic expression of the myth. Myths die when they no longer live and grow. Gnosis is characterized by the integration of archetypal contents. The holistic perspective on external and internal mirrors the alchemical "unus mundus." Today the same Gnostic or alchemical symbols and motifs arise from the collective unconscious. But the Promethean creative spirit goes largely unnoticed. The chthonic part of the psyche -- undifferentiated consciousness -- is our life-sustaining structure. Gnosis is a general human phenomena which can appear any time, anywhere, independent of tradition. Experiential knowing is a spontaneous creative phenomenon that reflects a rich reserve of ideas and images absorbed consciously and unconsciously, newly organized in novel ways -- familiar material placed in a surprising and creative context -- an achievement of particular genius. Man in antiquity differentiated between man's "daemon" and his "own mind". ~Carl Jung, Modern Psychology, Lecture VII, Page 50. The world is an image to us, even when we have a scientific conception of it and assert: "This is so and so", it is still only an image. ~Carl Jung, Modern Psychology, Alchemy, Page 62. But that "the One" should meditate, and that the world should be produced by the spirit in its creative role, is a conception which goes directly back to the philosophy about the Nous in antiquity. ~Carl Jung, Modern Psychology, Alchemy, Pages 59-60. In the Pleroma, Above and Below lie together in a strange way and produce nothing; but when it is disturbed by the mistakes and needs of the individual a waterfall arises between Above and Below, a dynamic something that is the symbol. ~Carl Jung, Letters Vol. 1, Pages 59-63. We find in Gnosticism what was lacking in the centuries that followed: a belief in the efficacy of individual revelation and individual knowledge. This belief was rooted in the proud feeling of man's affinity with the gods. ~Carl Jung, Psychological Types, Page 242. God is not dead. He is as alive as ever. God is creation, for he is something definite, and therefore differentiated from the Pleroma. God is a quality of the Pleroma, and everything I have said about creation also applies to him. ~Carl Jung; The Red Book; Page 348.
is genuine inner experience and how much is philosophical superstructure. ~Carl Jung, Letters Vol. 1, Pages 553-554. - The Pleroma is the totality of beings in the Upper Aeons. "We find in Gnosticism what was lacking in the centuries that followed: a belief in the efficacy of individual revelation and individual knowledge. This belief was rooted in the proud feeling of man's affinity with the gods." ~Carl Jung. Intuition is a form of creativity, supra-logic -- receiving input and ideas without knowing exactly how and where you got them from. You simply know it is not from yourself but an activity of the soul. Sometimes it is referred to as gut feeling, sixth sense, inner sense, instinct, inner voice, spiritual guide, etc. It is only the intervention of time and space here and now that makes reality. Wholeness is realized for a moment only—the moment that Faust was seeking: all his life. ~Carl Jung, Psychology and Alchemy, Page 214. Pistis Sophia (1896, 1921 ed). Fragments of a Faith Forgotten at sacred-texts. Apollonius of Tyana 1905, at sacred-texts. Thrice Greatest Hermes, vol. 3 (London: Theosophical Publishing Society, 1906) at sacred-texts. IS THERE A FEMININE GNOSIS? I could not say I believe. I know! "I think we could describe it as a very early form of Christianity, very different in many respects from what Christianity became later on. It is much more individualistic. It is much more orientated toward the personal, spiritual advancement and transformation of the individual, regarding figures such as Jesus as being helpers rather than sacrificial saviors. It is a form of religion that has a much more ecumenical and universal scope in terms of its relationship to spiritual, religious traditions other than the Christian. I would say that this appears to be, as far as Gnosticism is concerned, the time that the Greeks called the kairos, the time when the Gods are reborn. We live in an age, I think, when certain timeless ideas, which have been submerged and subdued for a long time, are making their appearance once again. In that respect we're living in very interesting times as the Chinese would say. Interesting times, spiritually powerful times, always cast a great shadow. There will also be great difficulties, but I think that Gnostic traditions, along with a number of kindred ideas, are being reborn at this time, and will have a significant influence in the future. Those of us who find ourselves working within that field are singularly blessed that we can do this work at this particular time. So I feel I'm at the right place and at the right time and I am profoundly grateful for all of that." I have had the experience of being gripped by something stronger than myself, something that people call God. ~Carl Jung; "The Old Wise Man" published in Time, 1955. Intuition [is] perception via the unconscious. ~Carl Jung; "The Archetypes and the Collective Unconscious", 1950. "As Above, So Below." = "Mind Above, Thought Below." There are two offshoots from all the Aeons, having neither beginning nor end, from one root, and this root is a certain Power, an invisible and incomprehensible Silence. One of them appears on high and is a great power the mind of the whole, who rules all things and is a male; the other below is a great thought, a female giving birth to all things. Standing opposite one another, they pair together and cause to arise in the space between them an incomprehensible Air, without beginning or end; but in it is a Father who upholds all things and nourishes that which has beginning and end. Gnosis, as a special kind of knowledge, should not be confused with. "Gnosticism." 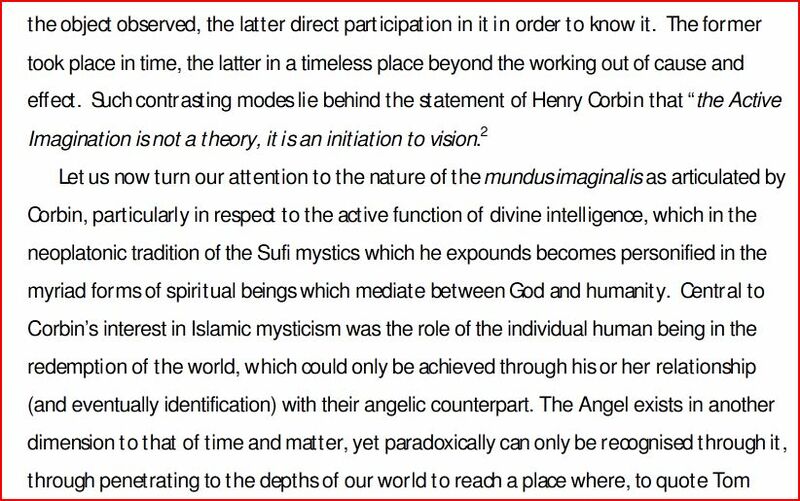 ~Footnote #13, Carl Jung, Psychology and Religion, Page 45. The "Gnosticism" of the 2nd and 3rd centuries A.D. contained much beauty and wisdom but also many of the writers of the time lost themselves within the web of their own words creating much confusion as to what they meant. Even at that time there were schisms withing "Gnosticism" where groups and sects formed that engaged in the most licentious behavior. "Gnosis" on the other hand refers to the structure and dynamics of the human psyche wherein "Knowledge" is "bestowed" upon an individual through the human experience that is commonly known as "Revelation." This "Gnosis" is not restricted by any particular religion, creed, dogma, culture or era but is largely the result and manifestation of how a particular individual lives their own life. Therefore a person born under a star over Mecca, Calcutta or Lasha may worship Allah, Shiva or Buddha and attain "Gnosis" while not worshipping Christ as the devout adherents to "Gnosticism" born under a Star in Alexandria, Egypt did in the early part of the Christian era. It is only through the psyche that we can establish that God acts upon us, but we are unable to distinguish whether these actions emanate from God or from the unconscious. We cannot tell whether God and the unconscious are two different entities. Both are border-line concepts for transcendental contents. But empirically it can be established, with a sufficient degree of probability, that there is in the unconscious an archetype of wholeness which manifests itself spontaneously in dreams, etc., and a tendency, independent of the conscious will, to relate other archetypes to its centre. The God-image does not coincide with the unconscious as such, but with a special content of it, namely the archetype of the self. It is this archetype from which we can no longer distinguish the God image empirically." 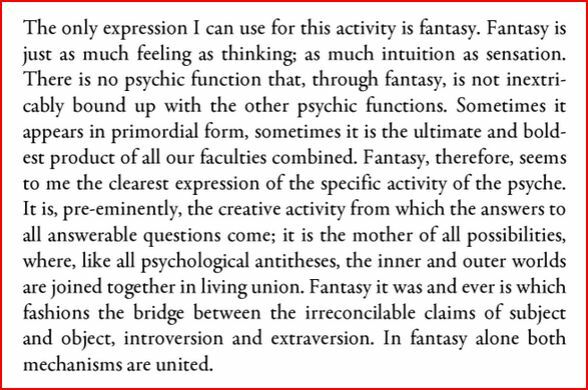 ~Carl Jung; Memories Dreams and Reflections; Page 395 and Psychology and Religion; West and East, CW 11, Page 468. The religious person enjoys a great advantage when it comes to answering the crucial question that hangs over our time like a threat: he has a clear idea of the way his subjective existence is grounded in his relation to "God". I put the word "God" in quotes in order to indicate that we are dealing with an anthropomorphic idea whose dynamism and symbolism are filtered through the medium of the unconscious psyche. Anyone who wants to can at least draw near to the source of such experiences, no matter whether he believes in God or not. Without this approach it is only in rare cases that we witness those miraculous conversions of which Paul's Damascus experience is the prototype. That religious experiences exist no longer needs proof. But it will always remain doubtful whether what metaphysics and theology call God and the gods is the real ground of these experiences. The question is idle, actually, and answers itself by reason of the subjectively overwhelming numinosity of the experience. Anyone who has had it is seized by it and therefore not in a position to indulge in fruitless metaphysical or epistemological speculations. Absolute certainty brings its own evidence and has no need of anthropomorphic proofs. ~Carl Jung, The Undiscovered Self; Page 64. Have I any religious experience and immediate relation to God, and hence that certainty which will keep me, as an individual, from dissolving in the crowd? "I am a Voice speaking softly. I exist from the first. I dwell within the silence..."
and Elethe of the Fourth. "He who possesses the Five Seals of these particular names has stripped off the garments of ignorance [the material body and subtle bodies: astral, causal, etc...] and put on a shining Light. And nothing will appear to him that belongs to the Powers of the Archons [rulers of the lower regions]. Within those of this sort, darkness will dissolve and ignorance will die. And the thought of the creature, which is scattered, will present a single appearance and dark Chaos will dissolve and ... until I reveal myself to all my fellow brethren, and until I gather together all my fellow brethren within my eternal Kingdom. And I proclaimed to them the ineffable Five Seals in order that I might abide in them and they also might abide in me." In 1947, French scholar Jean Doresse identified the Egyptian find at Nag Hammadi as a cache of rare Gnostic texts. "Gnosticism" is the label scholars use for a body of teachings derived from the Mystery Schools of pre-Christian antiquity. Gnostics who protested against Christian doctrines such as divine retribution and Christ’s resurrection found themselves targeted as heretics and were brutally suppressed by early converts to the One True Faith. This is the untold story of how the Mysteries ended. Since that signal year, 1947, some of the lost Mystery School knowledge has been recovered. A Gnostic sect evolved during the second century AD. and existed for several centuries afterwards. 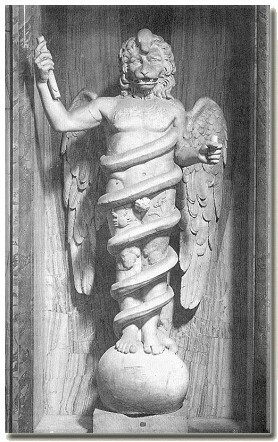 The name, or word, was derived from the Greek ophis, meaning "serpent, and relates to the great reverence which the Ophites had toward the serpent. The members progressed through full-fledged initiation ceremonies that included symbols for purity, life, spirit and fire. The entire system of the sect appears to be a combination of the mysteries of the Egyptian goddess Isis, concepts of oriental mythology, and early Christian doctrine. According to the theologians Origen, Irenaeus and others, the essence of the Ophitic Doctrine was that the God of the Old Testament was a misanthropic deity from whose power mankind had to be liberated. From this point of view the serpent in the Garden of Eden was a benefactor to mankind when he urged Adam and Eve to revolt against such a God. Therefore, other enemies of Jehovah in the Old Testament became heroes of the sect. As a mark of reverence for the serpent, it was reported, the snake took part in the sect's communion service. The following was reported by Epiphanius (fourth century Church Father) who called the service abominable. The snake was kept in a chest known as the cista mystica. At the beginning of the service the snake is summoned out. He then rolls among the loaves of bread which are on the table after which are broken and eaten. Following this each of those present kiss the snake on the mouth for it has been tamed by a spell. They have then fallen down and worshipped the snake as a part of the Eucharist service. They claimed they have sent forth a hymn to the Father, and thus concluded their mysteries. A.G.H. 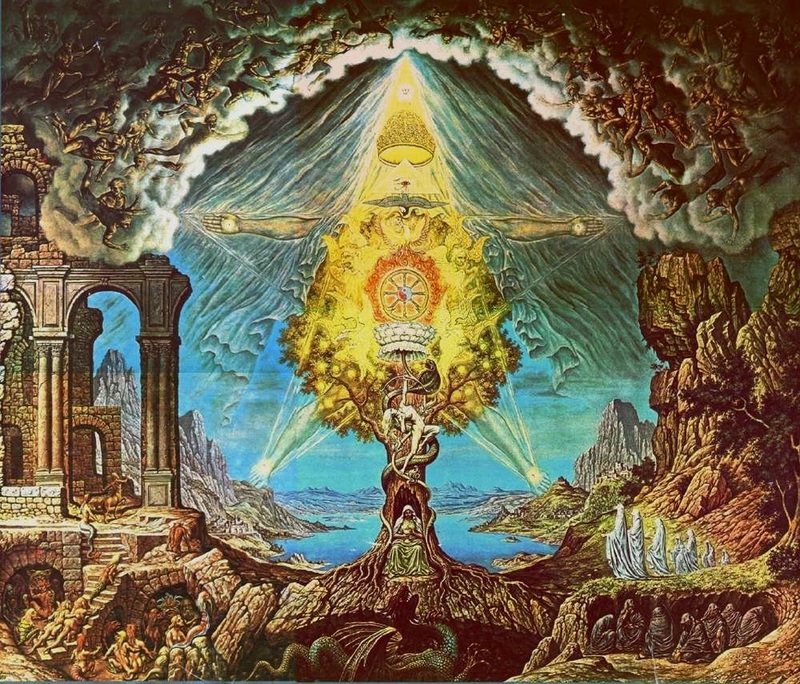 Although each Gnostic sect may emphasize one philosophical point over another, the fundamental aspiration always remains the same: the pursuit of gnosis ; thisis the common thread among all the sects. Gnosis, which in Greek simply means knowledge, is not of the intellect, or matters dealing with the everyday world; rather, gnosis refers to knowledge of the spiritual world. The highest form of gnosis would be the knowledge of the Divine--direct, experiential knowledge of God which is not taught or found in the Scriptures. There are really two adjacent forms of knowledge dealing with the spiritual world: knowledge of God (which we shall see is self-knowledge) and knowledge of special techniques, including passwords in order for the soul to ascend through various spiritual regions to the unknown Father. The underlying goal is to raise one's consciousness beyond the physical world to the higher, spiritual worlds. It is as though the body were a cage in which the soul (as a bird) is entrapped. When the soul vacates the physical body it is said to ascend through various spiritual realms and its consciousness becomes purified. Finally, it reaches its primordial home, the Divine. According to Gnostics, there is a substratum of reality, an Unknown, Nameless God who is unchanging and immeasurable, transcending any particularity or imposition one can attribute to It. In the Gnostic text The Apocryphon of John this Godhead is referred to as "the invisible One who is above everything," the "unnamable since there is no one prior to him to give him a name," and the "ineffable!' one beyond quantity and quality. And in Marsanes, God is described as "the Silent One who is not known." To Marcion, this Unknown Being is the "Alien God," symbolically signifying that the Divine is other to this world/creation. Each soul or spirit entity is seen as essentially the same essence of God, a pure spark or atom of divine consciousness. 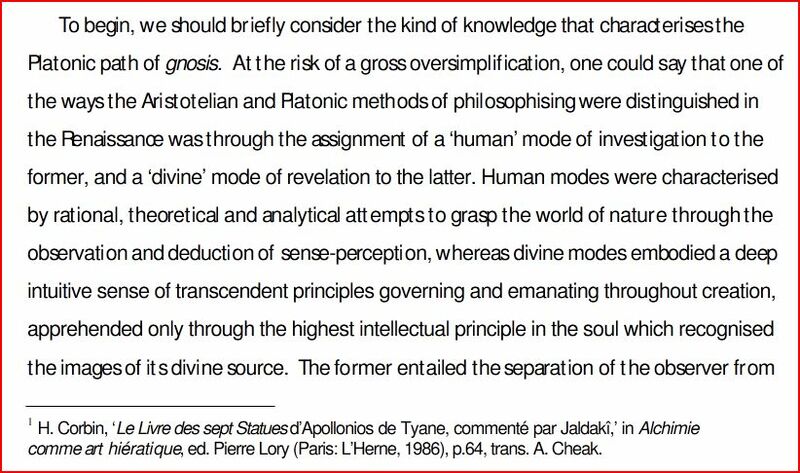 Hence, Gnostics are in some ways advocating a qualified non-dualism in which all souls are ontologically united in the Divine. In other ways, Gnostics are radical dualists, because they make a sharp distinction between the external, physical world and the internal, spiritual world. The common misnomer is referring to all Gnostics as pessimists who de-value human beings. On the contrary, most Gnostics assign an exceptionally high value to the human soul. The analogy of Plato's cave illustrates this better. According to Plato, the prisoner mistakes shadows on a cave's wall to be reality. But, argues Plato, it is the source of those shadows, the Light, which is the true reality. In the Gnostic view, one has the potential to unshackle the chains of ignorance and turn from the shadows on the wall to look reality straight in the face. The world/creation is seen as evil only because it attracts one to the outside, to the external, and in the process the inner Self is forgotten. This is the great "original sin" according to the Gnostics. Yet, between the third and fourth centuries C.E., the boundaries of Christianity are no longer as fluid, and groups are excluded as heretical. This is the age of the great heresiologists. Irenaeus, the first Church Father, is considered the greatest opponent of the Gnostic tradition. Its five books establish systematic guidelines to reject Gnostics. Several anti-Gnostic writers follow Irenaeus, among which are Hippolytus, Clement, Origen, and Tertullian. In the third and fourth centuries C.E., in an attempt to establish a strong institutionalized Church, extremely sharp boundaries were drawn. The Gnostic movement is accused of trying to undermine the Church, and, consequently, all Gnostic thought is condemned as a heresy. Most Gnostic writings are destroyed at this time. Indeed, the Gnostic tradition is a complex religious tradition with many fascinating dimensions. Their theology entails a Transcendent God far surpassing the creator god who rules over this earthly plane. The human soul, a microcosm of this highest Being, remains imprisoned in the body since it is fooled by the inferior power and fails to realize its higher nature. The cosmos is viewed as a dark prison and this results in different attitudes of ethics, including asceticism, moderate asceticism, or libertinism The overall objective of the Gnostic is to return to the Unknown God by awakening the human spiritual consciousness. But how does one awaken one's human spiritual consciousness? To answer this question we shall utilize the Nag Hammadi literature. But let us look at a comparable religious tradition known as the Sant tradition. 1. The first three are Christocentric, influenced by the Gospel of John and the letters of Paul; Mani is mostly influenced by Asian philosophy. Some argue Marcion is not a Gnostic because he did not accept the Gnostic tenet that souls are divine by nature or that it is gnosis that saves. Rather, he adopts the Pauline view that one is essentially corrupt and saved only through faith. For further discussion of Marcion, see Kurt Rudolph, op cit., p. 316. 2. The Greek term gnosis is cognate with Sanskrit jnana. Whether gnosis as such is comparable with jn3na-yoga (the causal path of knowledge), however, is debatable. 3. James M. Robinson (ed. ), "The Apocryphon of John H," in The Nag Hammadi Library in English (San Francisco: Harper and Row Publishers, 1988, third edition), p106. Hereafter cited as NHL. 4. Marsanes (X,l), in NHL, p. 463. 5. See Kurt Rudolph, op. cit., p. 62. Marcion and Valentinus apparently were excommunicated from the Roman Church for their philosophical position. 6. Mani's alternative church (i.e., the Manichean tradition) eventually died out in the seventeenth century in China. The three principles stressed were: 1) A Divine Man incarnated in different forms (e.g., Buddha, Jesus); 2) Outward observances like sacraments were totally unnecessary; 3) Evil did not originate from God (the world of Light) but had its own principle source--that is, the world of darkness. It is this world of darkness that overwhelmed archetypal Man, contaminating sparks of Light with material form. Mani's dualism of light and darkness, the realm of good and the realm of evil, seems to be directly influenced by Iranian Zoroastrianism. See Rudolph, op. cit., pp. 334-35. 7. This may not apply to Basilides, who, according to Hippolytus, believes that once God has pulled ready souls back to It a "great unconsciousness" will descend upon the rest of humankind. See H. L. Mansel, D.D., The Gnostic Heresies of the First and Second Centuries (London: AMS Press, 1875), p. 156. Yet, it is important to note that there are two irreconcilable accounts of the doctrines of Basilides: one is presented by Hippolytus and the other by Irenaeus. Which account renders a more accurate depiction of Basilides remains uncertain at this time. 8. For an interesting discussion on the philosophical connection between Gnostic ideas and Hindu thought see Geo Widengren, The Gnostic Attitude (Santa Barbara: Institute of Religious Studies, 1973). 9. I hesitate to describe the Gnostic tradition as a syncretistic religion. This label, although a seemingly neutral description, is often coupled with pejorative connotations, generally suggesting that the tradition is simply a subgroup which defiled its parent religion(s). 10. Today, we see this same spirit in the New Age Movement which tries to syncretize religions of the East and West, transpersonal psychology, and modem physics. 11. There is some indication that Gnostic ideas affect many of the writings of the New Testament (especially the Gospel of John). A debatable example is Colossians, which appears to deal with the problem of false teachers and reacts against varying concepts of the soteriology of the soul. Rules of food and drink and ascetical principles, often observances of Gnostics, are scoffed at. Moreover, 2 Thessalonians is in part written in reaction against advocates of a newly emerging philosophy, which, in this letter, are condemned as the lawless one, those "who exalt himself above every so-called god and object of worship, so as to seat himself in the Temple of God, claiming that he is god." Ephesians also warns against "teaching arising from human trickery," but this letter incorporates several attitudes similar to Gnostics. It discusses Jesus' descent from the inner regions and petitions the "Sleeper to Awake and arise from the dead." The letter of Jude, the second letter of Peter, and the Pastoral letters (1 Timothy, 2 Timothy, Titus) clearly attack false teachers who make reference to "what is falsely called knowledge." Several scholars suggest, however, that during the composition of the New Testament the Gnostic tradition was at such an early stage of development that the writers may have been reacting to another tradition other than the Gnostic tradition. 12. Pearson, op. cit., p. 8. 13. Ibid., p. 125. For further discussion of the relationship between Judaism and the development of the Gnostic tradition see chapter three of Pearson's book, pp. 39-51. 15. The Apolcalypse of Adam (V. 5), in NHL, p. 285. 16. For an insightful analysis of Seth, see Pearson, op. cit., pp. 52-83. 17. Irenaeus, Adversus Haereses, I.30.8; I.30.9; I.30.15. Hereafter cited as Adv. haer. 18. Irenaeus, Adv. haer., I.30.7. 19. God spelled with a lower case 'g' is not meant to be disrespectful in any way to the Judaic/Christian religion. It represents the Gnostic understanding of an inferior demiurge, while God with an upper case 'G' refers to the Gnostic Transcendent God. 20. The three Christian Gnostics (Marcion, Basilides and Valentinus) supported this theology, and both Marcion and Valentinus were excommunicated from the Roman Church for their philosophical position. 21. Trimorphic Protennoia (XHI,I), in NHL, p. 515. 22. The Apocryphon of john, in NHL, p. 111. 23. Henry Chadwick, B.D. and John Ernest Leonard, D.D., translators, "Stromata" (Bk. IIII), The Library of Christian Classics Vol. II. Alexandrian Christianity (Philadelphia: The Westminister Press), p. 58. 24. Irenaeus, Adv. haer., 1.24.2. 25. Stromata, Bk. III, p. 46. 28. Stromata, Bk. III, p. 52. 30. James E. Davidson, "Structural Similarities and Dissimilarities in the Thought of Clement of Alexandria and the Valentinians," The Second Century: A Journal of Early Christian Studies, Vol. III, No. IV (Georgia: Mercer University Press, Winter 1983), pp. 214-15. 31. Clement's own ethics clearly fall into this third camp. He takes the motto, "It is better to marry than to bum." See Stromata, Bk. III, p. 53. "Burning" here simply means desire and suppression of such only intensifies it. Celibacy is acceptable if "chosen according to sound rule with godly reasons, provided that the person gives thanks for the grace God has granted, and does not hate the creation or reckon married people to be of no account." (p. 85) He continues to add that "both celibacy and marriage have their own different forms of service and ministry to the Lord." (p. 90) In regards to dietary ethics, Clement again stands in the moderate camp. Ideally, he promotes a meatless, alcohol free diet, but, according to Clement, "if one partakes of them, he does not sin." See Stromata, Bk. VII, p. 532..
32. Stromata, Bk. III, p. 53. The publication in 2009 of C. G. Jung's The Red Book: Liber Novus has initiated a broad reassessment of Jung's place in cultural history. Among many revelations, the visionary events recorded in the Red Book reveal the foundation of Jung's complex association with the Western tradition of Gnosis. In The Search for Roots, Alfred Ribi closely examines Jung's life-long association with Gnostic tradition. Dr. Ribi knows C. G. Jung and his tradition from the ground up. He began his analytical training with Marie-Louise von Franz in 1963, and continued working closely with Dr. von Franz for the next 30 years. For over four decades he has been an analyst, lecturer and examiner of the C. G. Jung Institute in Zurich, where he also served as the Director of Studies. But even more importantly, early in his studies Dr. Ribi noted Jung's underlying roots in Gnostic tradition, and he carefully followed those roots to their source. Alfred Ribi is unique in the Jungian analytical community for the careful scholarship and intellectual rigor he has brought to the study Gnosticism. In The Search for Roots, Ribi shows how a dialogue between Jungian and Gnostic studies can open new perspectives on the experiential nature of Gnosis, both ancient and modern. Creative engagement with Gnostic tradition broadens the imaginative scope of modern depth psychology and adds an essential context for understanding the voice of the soul emerging in our modern age. Hermetism is often and wrongly confused with Gnosticism, which similarly originated in Egypt in roughly the same era. For present purposes, a few salient points of contrast will suffice. Like the God of Stoicism, the Hermetic God was omnipresent and omniscient through the material cosmos. In Gnosticism, by contrast, God was transcendent, and the physical universe was an evil place created by an evil Demiurge (van den Broek 1998). Hermetic ethics celebrated the divine within the world; Gnostic ethics were abstemious, ascetic efforts to escape from the world (Mahé 1998). Within each natural man is an "inner man," a fallen spark of the divine substance. Since this exists in each man, we have the possibility of awakening from our stupefaction. The Divine Spirit is symbolized by the vowel O, which is the eternal circle. The letter I symbolizes the Inner Being of each human being, but both are intermingled with the letter A, as a point of support. This is the powerful mantra or magic word. Gnosis, as a special kind of knowledge, should not be confused with. "Gnosticism." ~Footnote #13, Psychology and Religion, Page 45. For a certain type of intellectual mediocrity characterized by enlightened rationalism, a scientific theory that simplifies matters is a very good means of defense because of the tremendous faith modern man has in anything which bears the label "scientific." Such a label sets your mind at rest immediately, almost as well as Roma locuta causa finita: "Rome has spoken, the matter is settled." In itself any scientific theory, no matter how subtle, has, I think, less value from the standpoint of psychological truth than religious dogma, for the simple reason that a theory is necessarily highly abstract and exclusively rational, whereas dogma expresses an irrational whole by means of imagery. This guarantees a far better rendering of an irrational fact like the psyche. Moreover, dogma owes its continued existence and its form on the one hand to so-called "revealed" or immediate experiences of the "Gnosis" [See Footnote #13] for instance, the God-man, the Cross, the Virgin Birth, the Immaculate Conception, the Trinity, and so on, and on the other hand to the ceaseless collaboration of many minds over many centuries. It may not be quite clear why I call certain dogmas "immediate experiences” since in itself a dogma is the very thing that precludes immediate experience. Yet the Christian images I have mentioned are not peculiar to Christianity alone (although in Christianity they have undergone a development and intensification of meaning not to be found in any other religion). They occur just as often in pagan religions, and besides that they can reappear spontaneously in all sorts of variations as psychic phenomena, just as in the remote past they originated in visions, dreams, or trances. Ideas like these are never invented. They came into being before man had learned to use his mind purposively. Before man learned to produce thoughts, thoughts came to him. He did not think he perceived his mind functioning. Dogma is like a dream, reflecting the spontaneous and autonomous activity of the objective psyche, the unconscious. Such an expression of the unconscious is a much more efficient means of defense against further immediate experiences than any scientific theory. The theory has to disregard the emotional values of the experience. The dogma, on the other hand, is extremely eloquent in just this respect. One scientific theory is soon superseded by another. Dogma lasts for untold centuries. The suffering God-Man may be at least five thousand years old and the Trinity is probably even older. ~Carl Jung, Psychology and Religion, Pages 45-46. Serotonin a chemical present in your brain, that can be released through high states of meditation or through the use of psychedelic drugs, has been proved to make you susceptible to spiritual experiences. A team of Swedish researchers had found that the presence of a receptor that regulates general serotonin activity in the brain correlates with people’s capacity for transcendence, the ability to apprehend phenomena that cannot be explained objectively. Because of the mystical experiences users of psychedelic drugs like LSD have had scientists have long suspected that serotonin influences spirituality. Although now they have proof from brain scans linking the capacity for spirituality with a major biological element. Reporting in the American Journal of Psychiatry, the researchers see the evidence as contradicting the common belief that religious behavior is determined strictly by environmental and cultural factors. What it means is those with a higher concentration of serotonin receptors will therefore most likely show a stronger inclination towards experiences where they see God or they experience higher connections with themselves and the universe. Those whose brain scans showed the most receptor activity proved on personality tests to have the strongest proclivity to spiritual acceptance. Apart from the elevate consciousness experiences, Serotonin is in charge of moderating mood, metabolism, and sexuality. A team of Swedish researchers has found that the presence of a receptor that regulates general serotonin activity in the brain correlates with people's capacity for transcendence, the ability to apprehend phenomena that cannot be explained objectively. Scientists have long suspected that serotonin influences spirituality because drugs known to alter serotonin such as LSD also induce mystical experiences. But now they have proof from brain scans linking the capacity for spirituality with a major biological element. So what does this mean? Well, the researchers believe that it provides evidence that religiosity and spirituality are not defined necessarily or entirely by environmental or cultural factors, such as upbringing. Basically, those with a higher concentration of serotonin receptors will therefore most likely show a stronger inclination towards spiritual acceptance. Gnosis is a transformative imperative that challenges conventional beliefs about the nature of reality. We take our world to be an objective reality, but is it? The assumption that the physical world exists in and of itself has struggled to assimilate the findings of modern physics for some time now. For example, an objective space and time would just "be", but in relativity, space contracts and time dilates. Likewise objective "things" should just inherently exist, but the entities of quantum theory are probability of existence smears, that spread, tunnel, superpose and entangle in physically impossible ways. These causeless fluctuations in energy create force fields that emerge seemingly from nowhere. Particles flit in and out of existence at the threshold of matter. Virtual subatomic particles pop out of nothing and instantaneously disappear in matter/anti-matter annihilation that unergirds manifestation. Therefore, so-called "empty" space is not empty at all, but a seething sea of activity that pervades the entire Universe. If you accept the perennial mystical teaching that, at the level of consciousness, we are not only interconnected, but are actually one Self seeing through many eyes, then it should be clear that, like it or not, in the way we conduct our inner and outer lives, each of us is in fact always having an effect on the whole. What would you do if you realized that the entire human endeavor, the evolution of consciousness itself, depended on your willingness to transform your own consciousness? There is a science to self-awareness, there’s no voodoo to it. First, you realize that there is something to be realized. Once you do, your realization has begun. Reflect on this now. You are realizing it even now, as you reflect on this. Gnosis, as a special kind of knowledge, should not be confused with. "Gnosticism." ~Carl Jung, Footnote #13, Psychology and Religion, Page 45. This process of becoming human is represented in dreams and inner images as the putting together of many scattered units, and sometimes as the gradual emergence and clarification of something that was always there. The speculations of alchemy, and also of some Gnostics, revolve around this process. It is likewise expressed in Christian Dogma, and more particularly in the transformation mystery of the Mass. ~Carl Jung; “Transformation Symbolism in the Mass"; CW 11, par. 399. I . . . have the feeling that this is a time full of marvels, and, if the auguries do not deceive us, it may very well be that . . . we are on the threshold of something really sensational, which I scarcely know how to describe except with the Gnostic concept of [Sophia], an Alexandrian term particularly suited to the reincarnation of ancient wisdom in the shape of ΨA. ~Carl Jung, The Freud/Jung Letters, Page 439. Further, according to an early Christian-Gnostic idea, the spirit which appeared in the form of a dove was interpreted as Sophia-Sapientia—Wisdom and the Mother of Christ. Thanks to this motif of the dual birth, children today, instead of having good and evil fairies who magically "adopt" them at birth with blessings or curses, are given sponsors—a "godfather" and a "godmother." ~Carl Jung, The Portable Jung; Page 63. The doctrine that all evil thoughts come from the heart and that the human soul is a sink of iniquity must lie deep in the marrow of their bones. Were that so, then God had made a sorry job of creation, and it were high time for us to go over to Marcion the Gnostic and depose the incompetent Demiurge. Ethically, of course, it is infinitely more convenient to leave God the sole responsibility for such a Home tor Idiot Children, where no one is capable of putting a spoon into his own mouth. But it is worth man's while to take pains with himself, and he has something in his soul that can grow. It is rewarding to watch patiently the silent happenings in the soul, and the most and the best happens when it is not regulated from outside and from above. I readily admit that I have such a great respect for what happens in the human soul that I would be afraid of disturbing and distorting the silent operation of nature by clumsy interference. ~Carl Jung, The Portable Jung; Pages 362-363. Therefore the center of the circle which expresses such a totality would correspond not to the ego but to the self as the summation of the total personality. 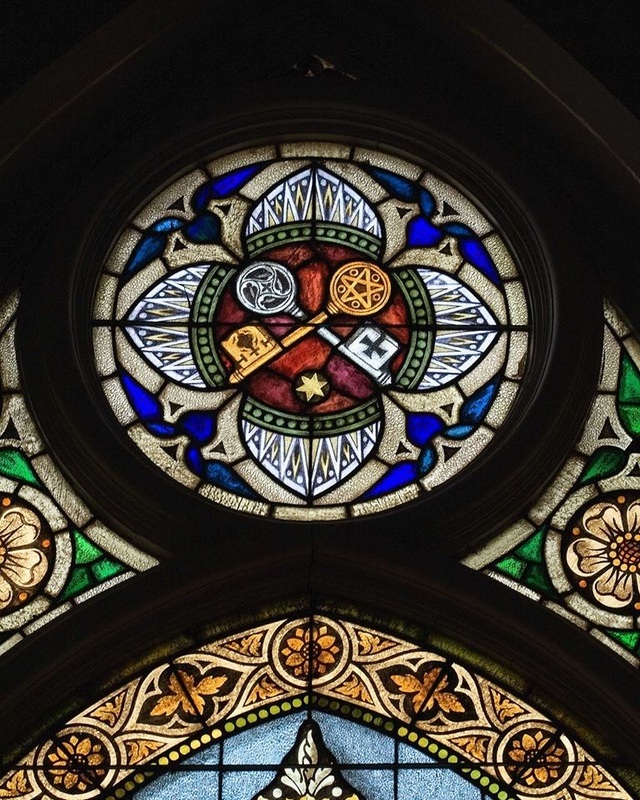 (The center with a circle is a very well-known allegory of the nature of God.) In the philosophy of the Upanishads the Self is in one aspect the personal atman, but at the same time it has a cosmic and metaphysical quality as the suprapersonal Atman. This same is he [Monogenes] who dwelleth in the Monad, which is in the Setheus, and which came from the place of which none can say where it is. . . . From Him it is the Monad came, in the manner of a ship, laden with all good things, and in the manner of a field, filled or planted with every kind of tree, and in the manner of a city, filled with all races of mankind. . . . This is the fashion of the Monad, all these being in it: there are twelve Monads as a crown upon its head. . . . And to its veil which surroundeth it in the manner of a defense. there are twelve gates. . . . I his same is the Mother-City-begotten. ~Carl Jung, The Portable Jung, Page 367. In alchemical literature this prophetess is taken to be Maria Prophetissa, also called the Jewess, sister of Moses, or the Copt, and it is not unlikely that she is connected with the Maria of Gnostic tradition. 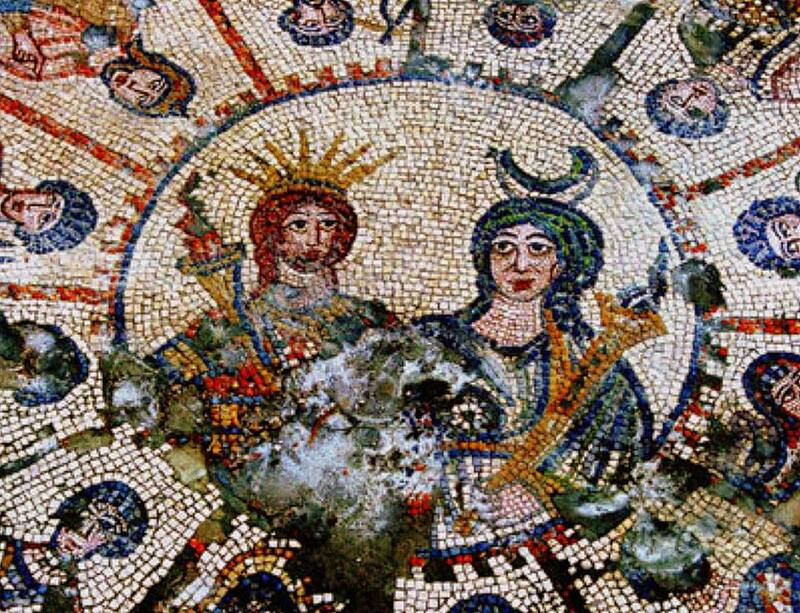 Epiphanius testifies to the existence of writings by this Maria, namely the "Interrogationes magnae" and "Interrogationes parvae," said to describe a vision of how Christ, on a mountain, caused a woman to come forth from his side and how he mingled himself with her. ~Carl Jung, The Portable Jung, Page 406. So the union of the two is a kind of self-fertilization, a characteristic always ascribed to the mercurial dragon. From these hints it can easily be seen who the philosophical man is: he is the androgynous original man or Anthropos of Gnosticism, close parallel in India is purusha. Of him the Brihadaranyaka Upanishad says: "He was as large as a man and woman embracing. He divided his self [Atman] in two, and thence arose husband and wife. He united himself with her and men were born," etc. The common origin of these ideas lies in the primitive notion of the bisexual original man. ~Carl Jung, The Portable Jung, Pages 407-408. The Son of Man is an anticipation of the idea of the self: hence the Gnostic adulteration oi Christ with the other synonyms for the self among the Naassenes, recorded by Hippolytus. The also a connection with the symbolism of Horus: on the one hand, Christ enthroned with the four emblems o\~ the evangelists—three animals and an angel; on the other. Father Horus with his four sons, or Osiris with the four sons of Horus. Horus is also the rising sun and Christ was still worshiped as such by the early Christians. ~Carl Jung, The Portable Jung, Page 443. That there is a general interest in these matters a denied, however much it offends against good taste. I am not thinking merely of the interest taken in psychology a science, or of the still narrower interest in the analysis of Freud, but of the widespread and every interest in all sorts of psychic phenomena, including spiritualism, astrology, Theosophy, parapsychology, and so forth. The world has seen nothing like it since the end of the seventeenth century. We can compare it only to the flowering of Gnostic thought in the first and second centuries after Christ. The spiritual currents of our time have, in a deep affinity with Gnosticism. There is even an "eglise gnostique de la France," and I know o( two schools in Germany which openly declare themselves Gnostic. The most impressive movement numerically is undoubtedly Theosophy, together with its continental sister, Anthroposophy; these are pure Gnosticism in Hindu dress. Compared with them the interest in scientific psychology is negligible. What is striking about these Gnostic systems is that they are based exclusively on the manifestations of the unconscious, and that their moral teachings penetrate into the dark side of life, as is clear!) shown by the refurbished European version of Kundalini-yoga. The same is true of parapsychology, as everyone acquainted with it will agree. ~Carl Jung, The Portable Jung, Page 467. Modern man, in contrast to his nineteenth-century brother, turns to the psyche with very great expectations, and does so without reference to any traditional creed but rather with a view to Gnostic experience. The fact that all the movements I have mentioned give themselves a scientific veneer is not just a grotesque caricature or a masquerade, but a positive sign that they are actually pursuing "science," i.e., knowledge, instead of faith, which is the essence of the Western forms of religion. Modern man abhors faith and the religions based upon it. He holds them valid only so far as their knowledge-content seems to accord with his own experience of the psychic background. He wants to know —to experience for himself. ~Carl Jung, The Portable Jung, Pages 467-468. I have purposely cited the ecclesiastical allegories in greater detail here, so that the reader can see how saturated Gnostic symbolism is in the language of the Church, and how, on the other hand, particularly in Origen, the liveliness of his amplifications and interpretations has much in common with Gnostic views. Thus, to him as to many of his contemporaries and successors, the idea of the cosmic correspondence of the "spiritual inner man" was something quite familiar: in his first Homily on Genesis he says that God first created heaven, the whole spiritual substance, and that the counterpart of this is "our mind, which is itself a spirit, that is, it is our spiritual inner man which sees and knows God." ~Carl Jung; Aion; Page 215.